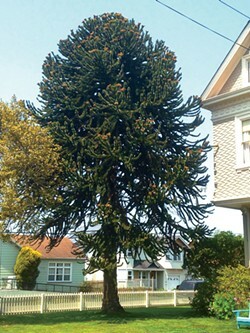 The Monkey Puzzle tree at 14th and J streets. Whether in their natural ecosystems, on old estates or in botanical gardens, the value of being in the presence of trees has been recognized for centuries. This, I believe, helps explain why so many varieties are distributed around the globe. Many of the trees seen in and around urban areas are strictly ornamental, trees that were not brought to North America for lumber or food production, but simply because someone liked the way they looked. Arcata has some spectacular specimens hidden in plain sight for us to discover. In fact, in a short eight-block walk you can see a tree representative of each continent that has the capacity to grow trees: Asia, Africa, Australia, Europe, South America and, of course, North America. Our quick trip begins at the top of the hill, H and 13th streets. Head north a short distance on the east side and look up. Here, I hope, is a tree that many passersby are familiar with, as it dominates and anchors the block. Fagus sylvatica Purpurea, or the European Cooper Beech, is a native to the central and southern parts of Europe and is not a tree planted in large numbers locally. Here is one of two in public view throughout Arcata at this maturity. From the sidewalk directly underneath it you can see the cross over limbs grafted into each other, a trait not too many trees share. This tree is incredible year round, though it captivates me each spring when the buds break and the new, fuzzy foliage slowly emerges. Now continue north to the corner of 14th Street; here is a traditional planting of Irish yew. Taxus baccata, whose native range includes North Africa in addition to Europe and Western Asia. This yew's vertical growth has made them highly desirable for framing views and entries and in gardens for hundreds of years. From here, cross H Street heading west on 14th Street. When you reach the alley, look south and up, and you'll see the very recognizable Eucalyptus globulus. This species was introduced to California from Australia and is heavily distributed throughout the state, a product of an experiment gone wrong, some say, as the wood did not develop the same traits that make it so useful in its native land. Continuing west, pop around the corner of I Street heading south and there you'll immediately be under some of the deepest shade you'll find on any of Arcata's sidewalks. Magnolia grandiflora, the Southern, or Evergreen, Magnolia, is native to southeastern North America. Its lustrous, deep green leaves, heavy branching and broad crown make this individual rival any of the others scattered about town. On those days that feel like steamy Georgia, take a cool glass of lemonade and stroll slowly by and you'll understand the importance of these trees to those that bear the South's summers. Now back out to 14th Street, head west one block to the northeast corner of J and 14 streets. This is one of the most peculiar trees around the area. All the way from the South American countries of Chile and Argentina is Araucaria araucana, better known as the Monkey Puzzle Tree, even though there are no monkeys in Chile or Argentina. This species is said to have been around for 200 million years, so consider this tree a living fossil. One can easily spot a number of these sprouting up in our area. Look for the few mature ones with their low branches arching all the way to the ground — quite a sight. Let us head down the hill to the southwest corner of J and 13th street and the lovely Japanese maple that resides there. Its common name speaks of its origin. Acer palmatum, native to Asia, has been cultivated for centuries, leading to the selection of more than a thousand varieties, hundreds of which are grown widely today and sought after by aficionados for their varying leaf shapes, delicate branching patterns and colorful leaves or bark. Go a couple of blocks east and you return to the place we began, but if you continue to look around, you very well may discover the other hidden gems that adorn this town's landscape. Whether with forethought or by chance, I'd like to thank those whose shovels dug the earth where these trees have spread their roots for all us to enjoy.